WHAT IF WE COULD TURN OUR BODY HOLOGRAM ON AND OFF, JUST LIKE THAT? 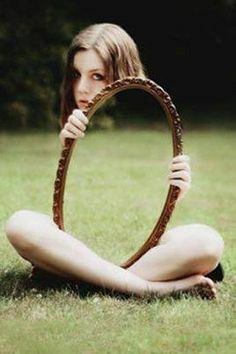 Image: Girl with her body hidden behind a mirror: https://s-media-cache-ak0.pinimg.com/236x/17/5a/22/175a2251d711c268e00f1cc42500a469.jpg .. I had an experience during the night of the recent X-flare that I thought it might be good to describe, in case others have the same experience. It felt like a V-shaped vortex of energy entered my physical body through my perineum, widening as it sped up through my body, and dissolving the substance of my body as it went. Image: “Body Dissolution,” collage by Alice B. Clagett, 19 September 2014, CC BY-SA 4.0 … Adaptation of a photo of Dr. Chirag sitting, from Wikimedia Commons … CC BY-SA 3.0, In the photo, Dr. Chirag is sitting crosslegged, with hands, palms up, resting on the knees. There is a grey vortical energy throughout the torso; the base of the vortex is where the person is sitting; the tip of the vortex is at the top of the person’s head. In recent years I had done some reading about the ‘collapsibility’ and ‘portability’ (through various dimensions) of the physical body. So, though the great majority of my body cells seemed to have just undergone an unlikely metamorphosis to evanescent insubstantiality, I noticed I still had the same awareness … ‘I’-ness … as before, and though I could no longer feel my body, I could still see it, which was reassuring. I sat quietly meditating. Over the course of the next half hour, I felt what I could only term an etheric template … the fifth layer subtle body that houses the perfect codes to create the etheric double. This etheric template, carrying the codes for some portion of my physical form … began to descend from my head through the right inside of my body. Then sensation and a sense of solidness started to return to my body field. I would not mention this experience at all, except that it occurred to me the reason I felt so calm during what might otherwise have been an unsettling experience was that I had previously read up on how the essence of the human body (technically ‘bodies’, as each of us has a number of subtle bodies, as well as a physical body) … is stored in only a few ‘permanent atoms’, and so transported from one lifetime, through the death and afterlife experiences, and then, through reincarnation, back into the physical realm. What happened that night was similar … the same permanent atoms allowed a near-total reboot of my ‘bodies’ while I still retained awareness. A reboot without physical death, now apparently quite doable through the finer frequencies of 5D. So I am including below some background information on portability of our personal ‘bodies’ … NOT so we can go out there and try it out for ourselves … but rather, so that, in cooperation with our Higher Selves, and with that of our Celestial Teams, our Spirit guides, the necessary transformations of our bodies can be accomplished, as the process of Awakening unfolds. And that with a minimum of hassle, so that we may participate with our Teams wide awake and tranquil, knowing that all is well. Citation: “The Causal Body and the Ego: A Publication of the Theosophical Society,” by Arthur E. Powell, available at www.amazon.com … public domain. Also available online as a pdf here: Link: Hermetics.org, http://www.hermetics.org/pdf/theosophy/Arthur_E_Powell_-_The_Causal_Body___The_Ego.pdf .. Image: “Diagram XXV. The Cycle of Re-Birth,” from “The Causal Body and the Ego,” by Arthur E. Powell, “Ch XXII. The Permanent Atoms and the Mechanism of Reincarnation,” public domain, available at http://www.lulu.com or http://www.amazon.com Also at: http://www.hermetics.org/pdf/theosophy/Arthur_E_Powell_-_The_Causal_Body___The_Ego.pdf .. Image: “Diagram XXV. The Cycle of Re-Birth,” from “The Causal Body and the Ego,” by Arthur E. Powell, “Ch XXII. The Permanent Atoms and the Mechanism of Reincarnation,” public domain, available at www.lulu.com or www.amazon.com Also at: http://www.hermetics.org/pdf/theosophy/Arthur_E_Powell_-_The_Causal_Body___The_Ego.pdf ..
Video: “Star Wars IV Luke Finds the Message,” by rstein926, 18 March 2013 … https://www.youtube.com/watch?v=WFrDg2BOXOM ..
Well, dear ones, points to ponder! This entry was posted in 01 - Physical body (3D), 02 – Etheric body / vital body / pranic body, A - My Favorites, Afterlife - heaven - hell - purgatory, Alice's perilous tales, Astrogeophysics - EMF - hologram, Clair senses, Drawings by Alice, Earth hologram, Health - healing, Karma - incarnations - causal reality, Physical body and subtle bodies, Physical regeneration, Portals - vortices - ley lines - stargates, School of Theosophy, Soul wounding - soul clearing - core star energy and tagged afterlife, astral body, Astral Permanent Atom, Atmic Body, awareness, body hologram, buddhic body, Clair senses, Drawings by Alice, etheric body, etheric double, etheric template, healing, incarnation, mental body, Mental Unit, my favorites, permanent atoms, physical body, Physical Permanent Atom, Physical regeneration, portability of body, portals, reconstitution of body, reincarnation, stories, subtle bodies, teleportation, vortex, vortices on 19 September 2014 by Alice B. Clagett.